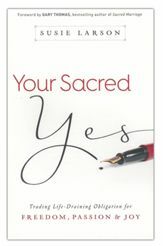 I cannot tell you enough about Your Sacred Yes but I can tell you that it’s a worthwhile read and one you won’t regret spending time on. It’s a book you’ll want to read again and again and the study guide and videos that accompany the book are fabulous as well! I received this book from Netgalley and Bethany House Publishers in exchange for my honest review which I’ve provided here.